Giggly Gumdrops offers Great Vinyl Wall Art and Decals at a truly unbeatable price! How excited was I when I came across Giggly Gumdrops?! With a vast array of designs and quotes, there is something for everyone. 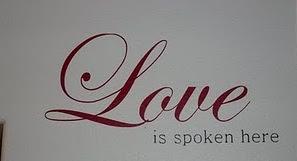 I am totally in love with Vinyl Wall Quotes! They add a unique touch to every room, and serve as a daily reminders ( inspirational and spiritual quotes are a favorite in my household). Though I have a great appreciation for Vinyl Wall Art, the prices can be steep. I have yet to come across a company that offers Vinyl Wall Art & Decals at such incredible prices as Giggly Gumdrops! You can customize a quote or design, choose color's that match your decor, and the service is beyond friendly (something that is rare, and very appreciated by this mommy). The order arrived very quickly, packaged with care ( ribbon ties, and great personal touches to the packaging that you don't see often). The quotes were customized to my specifications, and very easy to apply. They are a beautiful touch to our Master Bedroom, and are amongst picture frame clusters that I have hanging on two separate walls. A wonderful experience, and GREAT products! For beautiful Vinyl Wall Art that won't break the bank, and amazing service visit Giggly Gumdrops ! I'm positive that you'll be just as impressed as I am! Experience the greatness of Giggly GumdropsVinyl Wall Decor for yourself! One Lucky Reader will receive a $25 Electronic Gift Certificate to use as they choose! Leave a comment~ Which great great Vinyl Wall Art would you love to add to your home? The comment is considered your entry.